I don't usually purchase baseball cards but thought I would crack open a box of this stuff that I saw at walmart. All in all it was a fun break with a couple notable hits. If anyone is interested in buying anything please let me know! 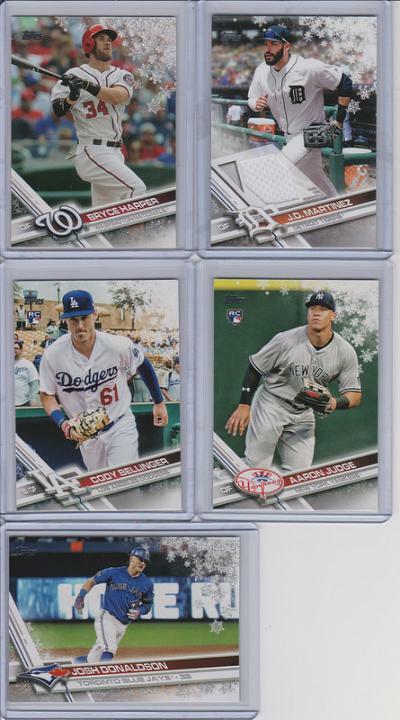 Harper and Donaldson are metallic snowflake parallels, the rest are the base snowflake cards. I also have 3 more metallic snowflakes of Kenta Maeda, Carlos Correa, and Alex Reyes.